This will be a 2 part post. In part 1 I will demonstrate deciphering a simple XOR encryption used in Lab 11-02 of Practical Malware Analysis by Sikowski. 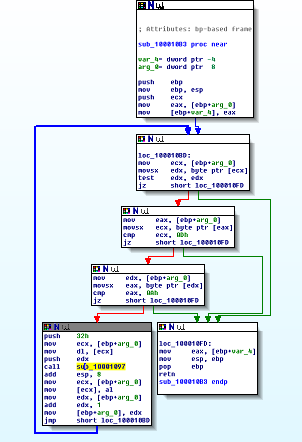 This lab also demonstrates a technique called inline hooking, where malware installs itself onto the system as a code library file (DLL) and then redirects execution flow to the memory address of the malicious DLL by modifying a few bytes in a legitimate function (in this case, it’s the send function which you will be familiar with if you have done any socket programming). The purpose of this post is to showcase a real-world method that malware can use to conceal itself, as well as document my approach to solving the problem and learn from my mistakes as well. However, since the lab includes an encryption algorithm, part 1 will contain handling that algorithm and how to decrypt it. It’s important to note that the AppInit_DLLs exploit can now be more difficult for an attacker to pull off as of Windows 7 and up because Microsoft has implemented code-signing, giving developers the ability to sign their DLLs as well as the ability for the administrator to boot into a mode completely disabling AppInit_DLLs in the first place. However, today’s exploits and attacks use this same line of thinking; DoubleAgent is a good example, which came out a few days prior to this post and is currently unprotected by Norton, McAfee, Avast!, MalwareBytes, etc… DoubleAgent affects Windows XP all the up through Windows 10 and is 15 years old, according to Cybellum1, further demonstrating that we can learn a great deal from seemingly old techniques. There are very few executables that do not link with User32.dll. But most modern Windows machines that have Windows 8 and up and that were shipped with a Windows sticker on them should not be susceptible to this type of attack with default settings on. This is because Microsoft pushes the computer retailers to enable something called UEFI Secure Boot by default. Secure Boot is not part of the operating system… It is part of UEFI which is said to eventually be replacing BIOS3. That said, it is possible to turn secure boot off, meaning, this attack could certainly still happen even on a newer system. To be sure that Secure Boot is on, hit the windows key (or otherwise go to Run) and type in “msinfo32”, find the Secure Boot State which is in the list that immediately pops up, and verify that it is set to “on.” If it is off, be sure to contact your system administrator prior to changing the setting if you are on a work machine as this could make some programs stop working… Such as those which rely on AppInit_DLLs. This looks like some sort of ciphertext, but is otherwise at this point useless. Perhaps a more experienced researcher would recognize the algorithm by just viewing it? Possibilities include network activity as noted by the wsock32.dll/send function, thread creation by OpenThread, possible file creation or activity using THEBAT.EXE, OUTLOOK.EXE, spoolvxx32.dll and MSIMN.EXE, and the RCPT TO strings seemed odd as well. Kernel32.dll and ADVAPI32.dll were flagged on suspicion that the program may try to spoof these files, but more than likely, they are just library calls. Also, the backslashes before the ini and spool files indicated possible file creation or lookup. the ListProcessThreads function takes a snapshot of the currently executing threads in the system using CreateToolhelp32Snapshot, and then it walks through the list recorded in the snapshot using the Thread32First and Thread32Next functions. In a nutshell, A “snapshot” of the current system’s memory state can be taken with CreateToolhelp32Snapshot (note the lowercase h in help) and then threads or processes can be enumerated through in in order to get information and/or search for something. 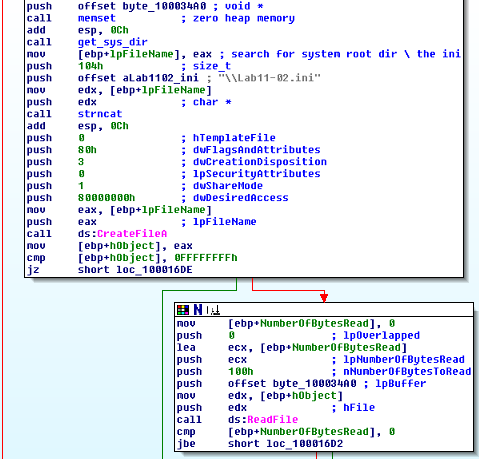 The Thread32Next and Thread32First tell us that the malware is probably searching for a particular thread characteristic by starting at the first and then enumerating them all until one is found. Also note that several different terms are used for this idea of “checking each item (thread) in the list (snapshot) and moving to the next” – enumerated, walking, scrolling, iterating, etc… MSDN uses enumerate and thread walking to describe this procedure. RegSetValueEx tells us this program writes to the registry. Several mathematical operations are performed on the key with constants 255, 666, and 4. 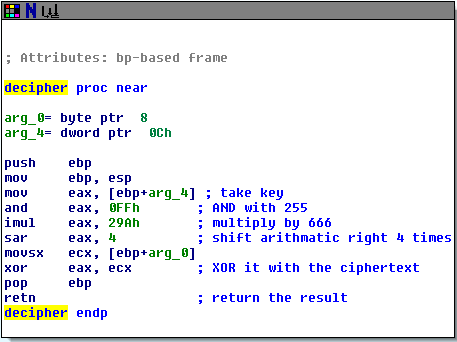 After this, the altered key is now XOR’d with the input ciphertext char, decrypting it. Thus, the only unknown here is the key since the math operations are all being done with constants and we already have the input chars in the .ini file. Fortunately, we’ve been provided with the key in a way-too-easy fashion due to poor design. Remember the last function with the loop? The first argument pushed on the stack and submitted to the decipher algorithm was 0x32, which is the decimal number 50. This is actually the key. We have all of the information we need to decrypt the message in Lab11-02.ini manually, or we could even write our own program or script which does it for us. We could open calc, turn it to programmer mode, and then take each char’s hex ascii value and XOR it with the result of (0x32 ANDed with 0x0FF, multiplied by 0x29A, bit shifted right 4 times). The final key is actually a constant so we can just take each char of encrypted text from Lab11-02.ini, look up the ascii value in an ascii table, and then XOR that hex value with the number 0x821 and this will decipher the message manually. But none of that is even necessary. 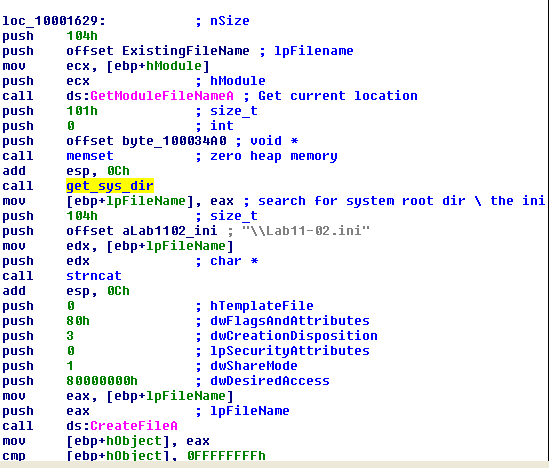 We can simply start this malware in a debugger like OllyDbg or x32Dbg, put a breakpoint at the memory address where this decipher algorithm is run, and then just step through it and grab the string after it gets deciphered by looking at the memory. So we let the malware do the work for us. There are even many other ways of doing this but the moral of the story is, we can make the malware do the deciphering for us or even write our own algorithm to do it since we have the key. In conclusion, we see that the encrypted text was an email address, “billy@malwareanalysisbook.com”. 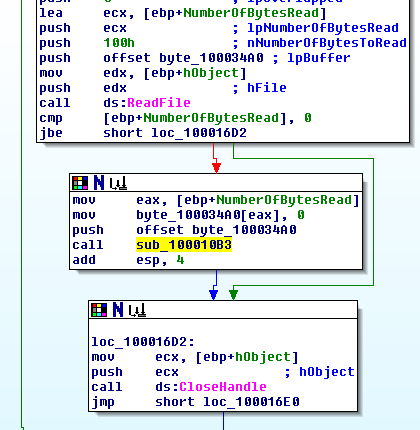 See part 2 for the last half of this analysis which will include the AppInit_DLLs/Inline hook portion and explain what the email address is for. Double Agent: Taking Full Control Over Your Antivirus. Cybellum. https://cybellum.com/doubleagent-taking-full-control-antivirus/. Published March 22, 2017. Accessed March 24, 2017. Ascii Table – ASCII character codes and html, octal, hex and decimal chart conversion. asciitable.com. http://www.asciitable.com/. Accessed March 26, 2017.